From the husband and wife team that brought you RhymieStymie comes Chain Of Thought – the free association word chain game! It’s super easy to learn and super fun to play. You never have to do any nasty typing. Just tap the words in the word pool to complete the Chain of Thought. There are 50 free puzzles to get you started. And additional puzzle packs for purchase if your brain begs for more. We hope you will love this word game as much as we do. Thanks so much for taking our new app out for a spin. How do I get additional levels to play in Chain of Thought? I’m willing to pay for them but can’t see where to do. Please advise. If you go to the home page you will see a button called “levels”. Tap this button and you will be able to purchase either the “pastry” or “vacation” puzzle packs. You will need to have an Internet connection to make the purchase. I just updated chain of thoughts. I had played all levels prior to today’s update. Upon updating and buying the new level, I discovered that when you play it, it does not accrue your score with your previous score and instead starts you zero. Please fix this. I was ranked in the top ten and had slipped to 27 while waiting for new levels and now I’ve been playing and nothing happens. This is a huge disappointment. I’m sorry for the loss of your high score. I will look into this issue for the next update. A few questions for you. Did you delete the old version of the app before installing the new version? Or did you update on top of the existing version by simply pushing the update button in the app store? Are you certain that the “total score” was reset to zero? The “round score” does get reset to zero whenever you switch to a different puzzle pack. But the “total score” should remain intact and then continue to increase as you play through new puzzles. The “total score” is the number that is sent to the game center as your high score. Usually, the only thing that resets the total score is choosing to replay a level you have already finished. An alert pops up and warns you that everything will be reset if you replay the level. Did you try to replay any of the completed levels? Finally, would you mind sharing which device and generation number you are using. How much memory is in the device? Also which version of the iOS is installed? Thanks so much for your help tracking this problem down. 64 gb iPad 3 With most recent iOS installed I don’t recal the number off the top of my head, but when they put the update out a few months ago I updated it. and I just hit update in the app store. I did not delete the program and reinstall. I am sure nothing has added to the previous score I am now listed as number 29 with 1,422,244 points (this number has not changed since the update) in the game center stats (mailscf) but my total score in the game is now showing as only 77528 . I also have not replayed a level that was already done, I mearly purchased the new levels you made available today and began playing them. Everything else is complete and untouched. Thanks Shawn for the additional info. Hopefully I will figure out the cause of your score issue and fix the bug for the next update. 2 more questions for you if you get the chance. When you go to the “stats” screen, does the “Total score for solo play” display your old high score or the new lower figure? Did you post a comment on the app store under the name “LeftBlue.” I’m trying to get a sense of how wide-spread this bug is. Yes that’s me. And no it shows that score of 77,528. Thanks for having such an open line of communication. I appreciate it. I’ve been going through withdrawal for the game while awaiting the new rounds. Round 9 Puzzle 5 of ‘Kittens’ works fine until the only options left are “day” and “tripper”. When I click day, it doesn’t register and there’s no way to move to the next round. Nm. Just saw the updated discription in the iOS app store. I’ll be anxiously awaiting the fix! I’m very sorry that this bug slipped by me. I will do everything I can to prevent it from happening again. The fix is just waiting for Apple’s approval. Unfortunately, there has been a 2 week waiting period for their approval lately. But I am crossing my fingers that they will approve this fix a bit more quickly. Apple approved the fix in record time. Please download the update and have fun! on the ‘kitten’ level I think it’s 35 the one where it has two words the same, “day” I go click the second one an it don’t do anything. I can’t move on to the next level. so if you guys can fix the glitch that be awesome! ps. I love this game! Yes, this was a problem but it has now been fixed. Please download the latest update (version 1.11). I am trying to purchase the other three topics, pastry, vacation or kittens but they have the word null on each option and I am not able to purchase. What gives? I’m sorry you are having trouble. Could you tell me which device and generation you are using? Several people with older devices (iPod touch 2nd gen and iPhone 3G) have reported the same problem. If you are using a newer device, please make sure you are connected to the Internet when you are trying to make an in-app purchase. Just downloaded and finished free level. Want to check my stats but the achievements and scoreboard won’t load for 2 days now. iPhone 4 running latest iOS. Thanks! Here are few things to double check. Make sure you are connected to the Internet. 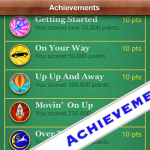 Make sure you have set up a game center account and that you are currently signed into your game center account. You can do this by tapping on the game center icon on the first page of apps on your iPhone. Thanks! I had somehow become logged out of game enter. Trying to play chain of thought but every time it goes to game center screen. Do not want game center. Just want to play chain of thought. Please advise. Are you playing the solo version of the game when this happens or the online version of the game? Can you supply a little more detail about what you are seeing happen. Does anyone know who plays the Sitar between levels of Chain of Thought game? I want to purchase that artist…. The sitar music is from FreeSound.org. The user name of the performer is “Kaiho”. I hope this helps. I hope all is well. Is there an email I can use to get in contact? I noticed that you weren’t cross-promoting any of your apps from Chain of Thought. We have a great free tool if you are interested. Should be a 10-20 min integration with Cocos2d. In solo play, I was wondering if there was a way to reset a level so that after if I’ve completed a puzzle, someone else in my family could then try the same puzzle on their own. The closest thing to what you’re asking is the “Pass & Play” mode. In this mode, 2 people take turns solving the same puzzle. 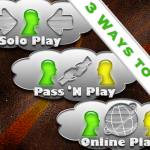 You simply pass the device back and forth between the players. Test out this mode and see if this satisfies your need. There is also a reset button (the button with the 2 curved arrows) on the Options screen. Pressing this button will reset the game back to the starting state for all the levels. I don’t think this is what you want, but it may come in handy after you have finished all the puzzles and you (or someone else) want to play again. Hi! I just started playing and I like the game, but how do I play with a friend that is also playing? Press the play button, then the Online Play button, after the Game Center window pops up press the square “+” button, finally press “invite friends” and choose one of your Game Center friends to challenge. Hi Jay, Thanks but when I do this, I hit “invite friends” it tells me “no friends” I know of one friend that is playing right now, but not sure how to play….Sorry but I still need help!! Press the “Game Center” icon on the home screen of your Apple device. Then press the “Friends” tab, then press the “Add Friends” button and enter the email address or Game Center nickname of your friend. This will send your friend an invitation to become friends with you. Once they accept your invitation their name will appear in the “invite friends” section of Chain of Thought. You only have to do all of this one time for every friend, then you will be able to play with them whenever you want and in all the games that support multi-player. Let me know if this solves your problem. I am unable to buy additional levels for this game. My apple account is fine no problems but when I try to by the puzzle packs I get a message saying see iTunes support to complete this transaction. I have NO restrictions on this account. What gives? I am not sure why you are having trouble. But I’m sorry you are experiencing this frustrating situation. Perhaps the problem is a temporary problem with Apple’s servers that will clear up shortly. Try to make the purchase again in a few hours. Also make sure you have a good Internet connection when attempting to make an in-app purchase. Which Apple device are you using? Which version of the iOS is running on the device? How much memory does the device have? What is the exact wording of the error message you are receiving? Hopefully we can figure out a solution to your problem soon. How do I clear the alerts? Are you referring to the red numbered badge attached to the app icon? This badge indicates that you have new Game Center related activity inside the app. Perhaps another player has finished their turn in an online match or perhaps a friend has sent you a new match invitation. Press the play button then the online play button then review the new activity by tapping on it in the pop-up “games” window. This should clear out the numbered badge from the icon. Hi there! I love this app and I want to play more levels. I have an Internet connection but it still says null next to the levels. What should I do? Thanks! Here are some things to check. Make sure in-app purchases are switched on under Settings>General>Restrictions>In-App Purchases. Make sure you are logged in to the App Store (Settings>iTunes & App Stores). If you still have trouble please write back with your device and iOS version. It still didn’t work. I’m using the new iPad mini with iOS 6.0.1. I’m sorry this issue is causing you so much trouble. I haven’t done any testing on the iPad mini (cause I don’t own one yet). But since it did work for a little while on your device, my guess is that Apple may be doing some work on their servers over the holidays. Perhaps try again in a day or two. I wish I had a more definite answer for you. Will you be offering this game app to Android users at any point in time? I recently switched from Ipod to Android and it’s such a bummer that the game is not offered. Yes, we do plan to eventually release all our word games for the Android platform. Unfortunately, this will likely take quite a long time. Hello Jay, and thank you for the response. I am willing to wait. I love android so I will definitely keep a watch out for game release. I can send you a picture if you like – just let me know how to do so. You are correct. But here was my thinking. If a word is almost always and only used as a proper name then I capitalized it (Elizabeth). However, if a word can also be used as a “regular” non-proper word then I didn’t capitalize it even if it is used to make a proper name in the puzzle (Taylor swift). That was my crazy logic. Thanks for taking the time to write to us. We love hearing your thoughts. Sorry you’re having this problem. I will try to reproduce it on one of my Apple devices. If I can make it crash on one of my devices then there’s a very good chance I can fix the problem. So it only happens when you’re playing a Game Center friend? Does it crash when you start a game with a friend, or when a friend starts a game and invites you to take your turn? What exactly is happening on the screen just before it crashes? Thanks so much for sharing any additional details. I hope I can fix this issue soon. Thank you for the details. I have a few more questions. Does the app ever work properly or do you always experience this crash when accepting a friend’s invitation? Does it happen with every friend or just one friend? Have you tried to completely shut down your device ( hold down the top power button until the option to shut down appears)? Sometimes a device can get into weird state and shutting it down completely can “magically” correct the problem. when i attempt to accept a friends invitation from the two people who are on my friends list. i can play a random game with no problem. but not able to play when “my turn” with anyone And yes when i called into Apple the rep who was extremely nice, had me to do a few troubleshoots one of which was shutting complete down until i saw the silver apple. i did the update as well and closed all of the apps that were running. Hey Jay any new updates regarding my issue? I sent you an email and a Game Center friend invitation. Please let me know if did not receive them. I sent you a match. See if you can take your turn. Also please invite me to a match when you get the chance. Tap on the Game Center icon on your device home screen. Tap on the “requests” tab on the bottom. Then tap on the “add friends” button. This will send your friend an invitation to become your Game Center friend. Once they have accepted your invitation you will be able to challenge them to a match from within the chain of thought app. Now Open chain of thought app>Tap Play button> tap Online Play button> then tap the + button on the top right corner > tap the Invite Friends button> select your friend’s name> tap Next button> finally tap Send button. It’s easier than it sounds– no really! Is there a version of Chain of thought for my computer? 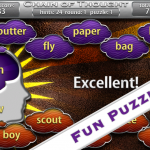 Currently, Chain of Thought is only available for iPhone, iPad and iPod touch. If you plug your device into a computer with iTunes on it, you will be able to upgrade your iOS version to the latest version. I love Chain Of Thought but it recently stopped working after I installed the suggested bug-fix upgrade. Now when I start it the game’s splash screen displays for a few seconds then closes. It doesn’t allow any inputs (eg, menu button). I hesitate to uninstall as I do not want to reset all my levels. Any suggestions? I’m sorry to hear you’re having this problem. Very frustrating! When did you update the app? Did it ever work after the update? Do you remember if you skipped one of the updates? You could try completely shutting down your device by holding down the power button and home button simultaneously for 10 seconds. But I’m afraid a reinstallation of the app is going to be the only way to fix the problem. My guess is the save file got corrupted during the update. I will have to do some investigating of the code to see if there is a bug somewhere but that won’t help with your current situation. Thanks for alerting me to the problem. Are there any plans for including VoiceOver support for this game? I just found out about it and I know several blind people, my wife included, that would LOVE to be able to play this game independently without somebody having to read all of the options. Thanks! Currently, there aren’t any plans to add voice over for the blind. But it is a good idea, so I will do some investigating. I downloaded Chain of Thought on my iPhone but the app is just frozen at waiting and I can’t open or delete it. What can I do now? What do you mean by “frozen at waiting?” Please check that you have a strong internet connection– preferably wi-fi. The app looks like it is downloading and says “waiting” underneath the app symbol which is dark just like it is actually downloading but it has been like this for weeks. I can’t open it and I can’t delete it. I do have this app on my iPad and it works fine. Frustrating game, with annoying punishment as the screen locks you out whenever you make a wrong guess and you have to wait before you can guess again. Many associations are possible, but there is only ONE right answer, the one the game designer specifies. Also, many odd Midwestern expressions not well known throughout the USA, never mind other English speaking countries. Needs to allow the same level to be played again with a higher difficulty setting. I have no idea how the online play works, you select an opponent in the Game Center, and then you just repeat the same game over and over, you never see the other person’s move or score? I am sorry you find our game frustrating. After your online opponent finishes their turn you can see a summary screen that compares how each of you did on the puzzles. I was wondering if this game will be made available for the MacBook Pro? I love the game and would love to play on my laptop also. Hi Andrea, maybe someday. But unfortunately, not anytime soon. Love TOT. I just upgraded from an iPhone 3GS to an iPhone 5s. TOT doesn’t seem to remember that I already bought the bundle for $3.99. How do I get it to recognize it’s still me? You can try tapping the options>restore buys button. What exactly is happening when you try to buy new levels? Do you have an Apple or Android device? I bought this app and completed all the levels. Then I decided to start all over. I was only asked if I was ok losing my spot on the leader board, which was fine by me, only to find that I have to purchase the app again in order to play all over. I need answers as to why this is happening. My app stopped working correctly this week on an iPad 2. It does not fill the screen so the far right word cannot be seen. I bought extra packs so don’t want to delete and reload. Sorry, I am old and have no idea how to screen capture but can google it. Hi,I’m playing on my android tablet and I purchased the full version. When I leave the game and come back to the levels and I’m unable to PLAY from the puzzle number I last completed. I went through the help pages and read where it shows the forward arrow to reach the last puzzle played. When i open the puzzle SCREEN there is a back arrow to go back but even though I’m up to 59 there is no forward arrow. It does show a SCREEN of level 59 so its been saved I just can’t play it. Please help, its pointless playing and spending the $ if I can’t progress. I’m sorry you are having this issue. Did this happen when you played the free version? Does this happen with any of our other word games or just Chain Of Thought? Can you tell me which device and version of android that you are using? I have tried the free version and want to purchase. But when i try to purchase the ipad just freezes. Sorry for the late reply. I am not sure why your iPad is freezing when you try to make an in-app purchase. Please make sure you are signed into your account by tapping settings on your device and then tapping the iTunes and App Store tab. Also make sure you have a good internet connection. Please send me an email at jbacal@aol.com if you are still having trouble. 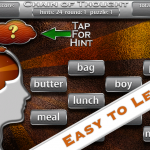 I downloaded the Chain of Thought 2 app and purchased the $2.99 pak to unlock all puzzles. It no longer recognizes that I have purchased that pak. I have clicked the ‘Restore Purchases’ option multiple times but it did not restore. I have also deleted and reinstalled on my iPad and it still does not work. Hi, I’m having trouble with the app. It will not open and load. Please help. Favorite app in the App Store because it allows for Such creativity! We love playing it and telling others about it!